The Metallic Materials Properties Development and Standardization (MMPDS) Handbook, is an accepted source for metallic material and fastener system allowables recognized by the Federal Aviation Administration (FAA), all departments and agencies of the Department of Defense (DoD), and the National Aeronautics and Space Administration (NASA), within the limitations of the certification requirements of the specific government agency. MMPDS-08 supersedes MMPDS-07 and prior editions of the MMPDS as well as all editions of MIL-HDBK-5, Metallic Materials and Elements for Aerospace Vehicle Structures that was maintained by the U.S. Air Force. The last edition, MIL-HDBK-5J was cancelled by the U.S. Air Force in March of 2006. The MMPDS Handbook is updated on a regular basis to ensure that: • Reliable, statistically based design properties are available for as many mature materials and/or product forms as possible • Current statistical design properties are validated or updated on older “legacy” alloys • Other supporting data (fatigue, crack growth, fracture toughness, effect of temperature) are represented • Recently cancelled specifications are identified MMPDS-08 contains design information on the mechanical and physical properties of metallic materials and joints commonly used in aircraft and aerospace vehicle structures. 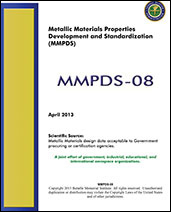 If you do not have access to SAE MOBILUS via username/password or institutional access, you can still purchase the Book, Metallic Materials Properties Development and Standardization (MMPDS) Handbook - 08.